Marshalls’ block paving sand is designed to be the ideal finishing touch for any concrete block paving project. From driveways to entire shopping precincts, Marshalls’ sand is an easy-to-use product for filling joints between paving stones. Block paving sand from Marshalls is specially selected and kiln dried to make sure it is suitable for utilisation in projects using all types of concrete block paving, delivering maximum coverage and resilient performance. Choose from two colours of block paving jointing sand. A red option is available for standard block paving, with a golden option available for use with lighter coloured products. Both are available in 25kg or 1 tonne bulk bags. All Marshalls high grade subbase aggregates and sands meet British Standard requirements or better and can be delivered direct to site or collected by arrangement. 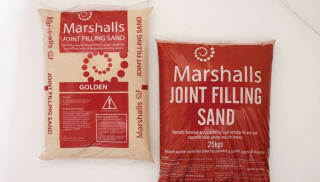 To find the perfect jointing sand for any project, browse the full range now.